Without really thinking about it, I started exploring a new aspect of the main theme in my San Francisco State class--the utopian impulse in California culture. The new wrinkle is the form that impulse takes in the northernmost part of the state. My exploration started with the film "Humboldt County," which I finally saw on DVD a few weeks ago. It's about an emotionally shut-down medical student in Los Angeles who reconnects with the world after he stumbles upon an alternative (read: pot-growing) scene in Northern California. No need to rehearse the plot details here, but the people he meets are deeply ambivalent about the utopian--or is it dystopian?--community they've created. Fast forward to a PoliPointPress book event here at Book Passage a couple of weeks ago. Peter Coyote joined some of us for dinner before Norman Solomon interviewed Reese Erlich about his new book. Turns out Book Passage had a copy of Peter's memoir, Sleeping Where I Fall, which I've wanted to read for a while. I bought it, Peter signed it, and I recently read the passage about his experiences at Black Bear Ranch, a commune founded during the 1960s in Siskiyou County. Fascinating. 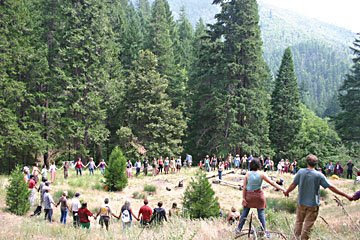 Today I discovered a related documentary, "Commune," which is devoted to the Black Bear Ranch story. It includes Peter and features the folks in his book. Again, the utopian impulse behind the commune produced deeply mixed results. I won't ruin it for any fanatical readers of this blog, but it's worth a look if you're interested in the California counterculture of this period.